Planning this edition of French Word a Week was a complete "house" collaboration this time around. My dad picked the word, my mom got tickled pink when I got her involved into styling the picture. What did B. do? What he does best: ate the props! A little family project is always a fun when there is French and English simultaneously flying around. I just watch and take it all in. I admit I drew a blank when picking this week's word (too many options I guess) until I stripped it down to the bare essential of something we see or eat daily. It has to be grapefruit for us. My dad eats half a grapefruit daily, B. drinks a glass every morning and I nosh on grapefruit sections in the afternoon for a little vitamin pick-me-up. Mom? She buys them. By the crate. Especially when we are all together! Today's word, pamplemousse, makes me think of plump, ample, soft, sunshine. It's one of those words I love to hear B. say outloud. It makes me giggle. You can listen to the pronunciation here. Thanks to my mom I recently discovered the artist Catherine Martini who dedicates her work to painting all sorts of sweet things. I love the burst of colors, the shapes and subjects she choses to illustrate. Visiting her site always brings in some sunshine in the house. I wanted to share her work with you and thought a giveaway would be fun. But...it's not all. I am throwing in a copy of "Unforgettable Desserts" by Dede Wilson which contains 140 thorough recipes for desserts you can make all year round. The handful of recipes I made from it were a hit with everyone so I am confident you will find something tasty in it also. To enter to receive a set of 3 cards from Catherine Martini and "Unforgettable Desserts": leave a comment on this post (one entry per person) between Friday March 26th 2010 and Monday March 29th, 11pm (US Eastern time). Anyone can enter, I'll ship worldwide. We will be out of town this weekend and since I moderate the comments manually, bear with me if you don't see yours appear right away. That word is making me laugh, too. ;) Those cards are stunning - I want to eat them, that is how good they look! My father believes pamplemousse appears on dessert menus to fool non french speaking diners. It sounds so fanciful. YUM! I adore grapefruit, in fact I am just about to eat a vanilla cupcake with grapefruit ginger buttercream frosting! Grapefruit season always makes me happy! I love getting a huge bag. My hubby and I will go through them in a snap. Pamplemousse is also the name of a wonderful San Diego-area restaurant. --Likely what locals here think of when they hear this French word! Though I'm not as fond of grapefruit as your faimly is, I have always loved saying the pamplemousse. It is just fun to say! My boyfriend is the fastest grapefruit eater I've ever seen. I am the type that carefully pulls out each section to arrange on a plate for snacking through out the day. He on the other hand manages to scarf down the entire thing with no tools except his fingers. I've secretly been timing him, and lately, his speeds are somewhere in the 2 to 3 minute zone for a large grapefruit. I've always loved that word-- it evokes the color of a grapefruit so much better than "grapefruit." The word SOUNDS pink! Wow, what adorable cards! 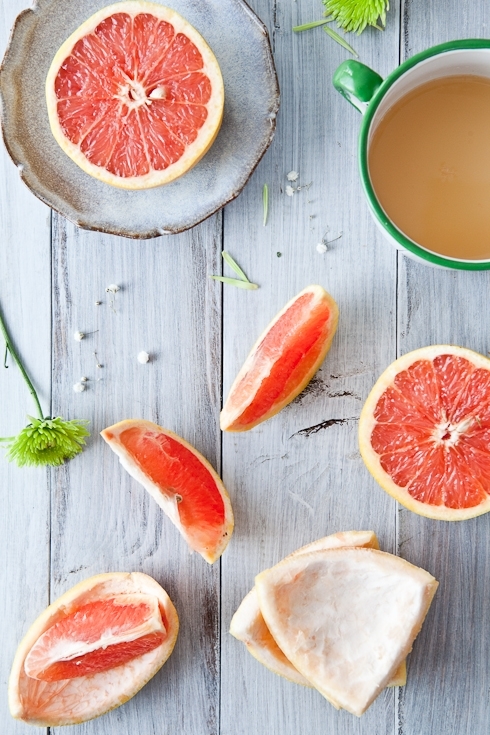 Your grapefruit photos are absolutely gorgeous! Love the word a week feature - taking me back to the days when I studied French in school and was much more well versed. I always loved pamplemousse as well! Grapefruit is one of my favorites too. I was not a great fan of grapefruit, until my mother showed me how to buy the ones that are ripe, not just pretty. Now, I am trying to make ice cream out of it, it's a challenge! "unforgettable Desserts" has been on my "to buy" list since I saw it. Mousses and gelees are things I've never been passionate about making but would really like to try my hand at. I love your pamplemousse pictures! I eat grapefruits daily as well. Sometimes up to 3! What a wonderful surprise! Thank you for a chance to win. And there is something about citrus that is like sunshine on a plate, isn't there? The cards are lovely! Grapefruit is one amazing fruit - I eat the segments to receive all the benefits - fiber and Vit. C.
Funny that's the only word I know in French. It's because my friend has been calling me that for a few years now, although I'm not plump or round. :-) She just liked the sound of the word. I love your website. I can always count on beautiful pictures of your scrumptious foods. Yummy! The word pamplemousse is my favorite! It never fails to make me smile. Man, that grapefruit looks so yummy and i can't have any, stupid medicines! lol but those pictures look so cute and i can have those! HAHA! I just bought a big bag of grapefruits that we currently enjoy every morning! Great post, as always! It makes me hungry for grapefruit! I love grapefruit. Thanks or sharing new words with us! I love grapefruits cut in half with a little pat of butter on top, topped with brown sugar, and baked in the oven. So tasty for breakfast. I have of pamplemousse before, but you had to remind me. It does not conjure up what it actually is! The prints are delightful too! Grapefruit tends to be a bit sloppy for me.. too much juice? I love pomelo! and our pomelo tree did not fair this winter well. I love the word, I love the fruit and I love the look of those beautiful cards. Well now I am craving a grapefruit! Growing up I always shared them with my mother and grandmother at our ski cottage in New Hampshire - I used to eat them with a grapefruit spoon and leave lots of bits because I liked to squeeze out the juice and drink it! You have such a lovely blog, and pictures are amazing. I love grapefruit in a salad combined with oranges and avocados, tossed with greens and some pine nuts, poppy seeds, red wine vinegar + yogurt + honey dressing. Yum! I just finished off my morning grapefruit, so this post was perfectly timed! And what a lovely giveaway! What a great word! Sounds like you and your family are having a blast. Hope I win the prize... I can't get enough cookbooks! I'm with B, eating the props is my favorite part, too. I love grapefruit! My parents just brought back some from FL that a batty old lady steals from neighbors' trees and leaves on their door step. I LOVE grapefruit!! And the picture you took is so beautiful! I have had grapefruit fever lately! My latest (and favorite) incarnation has been a buttermilk vanilla bean cake with grapefruit segments in syrup. yum! I have fond memories of grapefruits from my childhood. My grandfather used to eat one every morning and just to be silly we would wear swimming goggles so we wouldn't squirt juice in our eyes. Such beautiful prints! I only took one year of French, didn't really think I had retained any of it until I was in a cafe in Paris with my sister attempting to choose drinks and snacks, and suddenly remembered: pampelmousse=grapefruit. I would love a dessert book! I'd love a chance to win those beautiful cards- and the cookbook, too! I'd love to win the pictures and dessert book. i've been thinking about learning another language - french it is! pamplemousse. Mmm, pamplemousse - what a fabulous word. And the prints are beautiful! I just had a salad with grapefruit, walnuts, and feta. Delicious! It is a delightful word. How lovely that you are all able to participate. What a gorgeous photo, and I love the word "pamplemousse". Catherine's work is really beautiful, too, and seems to compliment your blog wonderfully! ok, now i'm hungry. between the grapefruit, those beautiful cards, and that gorgeous dessert cookbook i am positively salivating. wishing i had some grapefruit in the house right now! Les photos sont somptueuses... je tente ma chance pour le livre. Bon weekend! Doesn't EVERYTHING sound better in French?? Love the new word a week feature!! It's cute that you think your husband's pronunciation is funny. Looks beautiful. I'm a big fan of Dede Wilson -- I got the recipe I used for my wedding cake from one of her books, and I swear by her holiday cookies book. So I'm throwing my hat in the ring. The paintings are lovely, too, of course. And pamplemousse is one of my favorite French words. Right up there with invraisemblable. haha, pamplemousse is one of those French words I will never forget I think. I'm glad it was your word of the day!! I don't even really care for grapefruit and I know the word, how weird is that?! Mmmm, I love the word pamplemousse. I also love dessert and cookbooks! My first comment here, though I have been following your blog for sometime. Your pictures make me drool every time I visit! I love grapefruit too and can eat a couple everyday..Love the cards and love the giveaway! Thanks for the french word a week idea. I am really enjoying it. That is a funny word. I keep picturing a mouse. It sounds like a great book and the cards are really cute. Lovely photos. I like when my family gets involved in mine, too! Giveaways are fun! Thanks for sharing. Love the art and the word pamplemousse. I grew up eating a half grapefruit every morning when they were in season. Now I'm continuing that tradition with my young son, who already loves his grapefruit. Have fun with your family! :) Thanks a bunch for your find; I've been wanting something appropriate to decorate the kitchen, but nothing quite suited -- I'm excited about her work! I love grapefruit. Your pictures are beautiful. Loved the word...made my 6th graders giggle. Pamplemousse is my favorite French word! Excellent choice for word of the week, it put a big smile on my face. Looking forward to sharing with my eldest son who is in his 3rd year of French. I'm sure he'll get a kick out of my pronunciation. The word is fun, but the tease about the gluten free puff pastry is much more exciting. I just found out I'm gluten intolerant, so I am really looking forward to the recipe. The card makes me want to make some macarons. They are the prettiest cookie! I am not a grapefruit fan... But some words are definitely fun hearing... Like "cucurbitacé", said by an american, is to laugh out loud for! Pamplemousse has actually been one of my favorite french words since I learned it back in 7th or 8th grades. So fun! I love grapefruit! An amazing name like pamplemousse only makes it better! Love the book and the cards are beautiful. Who knew the word was pronounced that way? Made me laugh. Oh, I'd love to win this giveaway. The art is lovely, and recipes, I love 'em! Have a great weekend and thanks for your willingness to ship globally. I'm often disappointed by those who exclude intl. bloggers. Pamplemousse sounds so much nicer than "grapefruit". I love grapefruit season in Florida because you can taste the sunshine and warmth in every bite! Those paintings are adorable! Love it!! 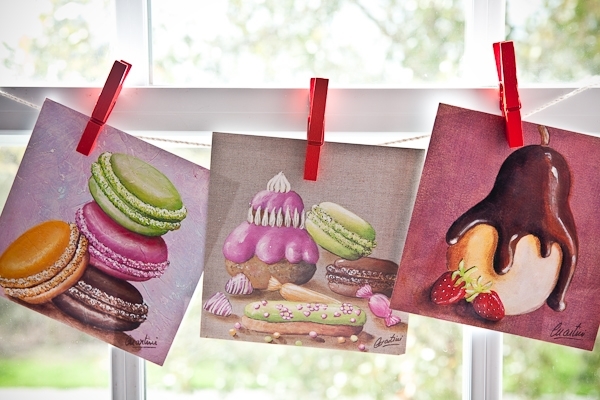 The macarons on those cards are delicious! Great word of the week! When I first learned of the word pamplemousse my mind kept pronouncing it as pampermousse. So now, every time I see the word, I think of pampered grapefruits! Well, have a wonderful weekend! As far as I'm concerned, I have only to look at these beautiful pictures to become hungry xD!!! I love the sound of that word. It just pops off the tongue and lips! I need to eat more grapefruit. hehe. The cards are very pretty! When we were seniors in high school my husband welded a "sculpture" which he entitled "Le Pamplemousse de Pouvoir." We still have it, I think, but I've managed to hide it away in a box somewhere. He loves grapefruit... Thanks for the giveaway! I'm Canadian and all of our products have French on them. I always loved saying jus du pamplemousse! That has always been one of my favorite French words! I love how it rolls off the tongue. Such beautiful cards! 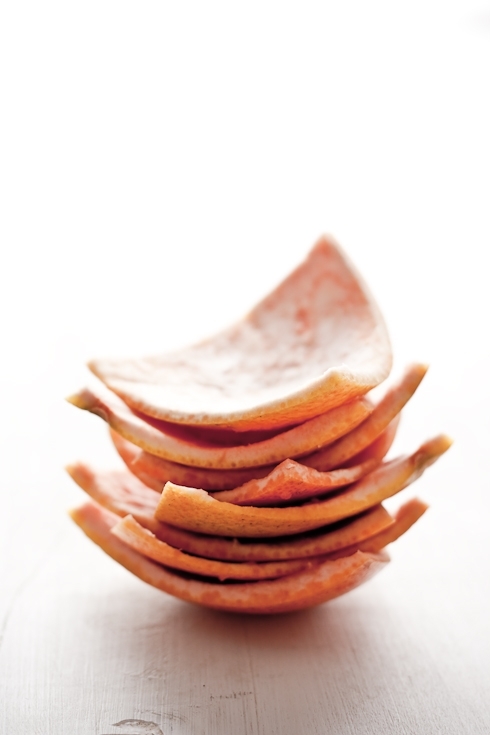 Please tell me that those beautiful peels will be candied and dipped in chocolate for all of us to enjoy :). I love the "word of the week" feature! Have a great weekend with your family. Hope you had a lovely trip, and not too overwhelmed by all the postings. I spotted your swirly turquiose macaron months back. I have to say they really look like works of art. I was on the topic of macarons with my mum, it made me thought of you and your macarons. That's why I'm back for a visual treat. It's really hard to find good comercially-available macarons in Singapore. such a bouncy word. i remember a book called Madam Pamplemousse and her edible adventures (i think) for kids to introduce them to foodie delights. The cards are lovely, I'd like to win them! What fun artwork to go with such a fun word! Pamplemousse--I'll remember that. I never liked grapefruit till I tried it broiled. Mmmm, so good. Beautiful, beautiful photos and artwork. Reminds me that I need to try my hand at macarons & that I have two pamplemousse in the kitchen that are calling out my name! Pamplemousse--c'est si bon! Votre images sont belles aussi. Those cards are beautiful! I love colour in my artwork and in my food. That cookbook sounds amazing too. Count me in! Pamplemousse is ever so much more chic than grapefruit! And I have two in my fridge right now. The cards are lovely and happy, aren't they? They make you smile. Martini just has to be a foodie! The cards are gorgeous - thanks for sharing! Can I join too ?? Yay for learning new French words! especially when they are for one of my favorite fruits...thanks! Grapefruit is by far my favorite citrus! One of my favorite drinks is mixing grapefruit juice with a little cranberry juice. And adding a little something extra on those lazy summer days. Your blog is such an inspiration! The cards are as beautiful as the food you create! Pamplemousse! I've been saying this word a lot today too. When I was a kid our neighbor would always come over with large bags filled with grapefruits. We'd eat them cut in half, with a spoon. I collect any dessert related art work,so I hope I win this giveaway.But if not thank you for introducing us to such a talented artist Catherine Martini. Nice giveawys :)) Have a nice weekend! Awesome word choice. Speaking no French, its pronunciation continually surprises me. Not only is pamplemousse one of the most wonderful sounding words, but the colour of ruby grapefruit is just perfection. When I was 10 we spent the summer at my grandmother's house and I was introduced to pamplemousse crystalisee. I'm not sure I would have even tasted it then - never mind loved it! - had I known what fruit it was in English. Thank heavens our tastebuds continue to develop as we grow up. And Macarons! They are everywhere I look at the moment. They seem to be following me, begging to be made. Soon, I will make them, as the memory of eating them on a sunny day in Rouen last Ausgust everytime I see a picture practically has me drooling. I've always loved the word pamplemousse. It sounds so... spring-like! Pamplemousse has been one of my favorite french words since I first learned it in my 6th or 7th grade french class!!! Fingers crossed for winning pretty goods! Fun fact: A dear friend named her iPod "pamplemousse" :) Whenever I hear the word pamplemousse, I imagine her rocking out to her iPod! How funny! My favorite flavored Perrier is the Pamplemousse Rose and my bf always makes fun of me and says pamplemousee in a BAD French accent! I love grapefruit but am not supposed to eat it because of meds I take. Sometimes I do anyway - I love the tart flavor. Your pictures do it justice! My daughter and I share a grapefruit in the morning. I cut it in half and carefully cut around the sections and we eat it, one half each, with small spoons, slurping the juice out of it's "cup" at the end. Pamplemousse! Pamplemousse, pamplemousse, pamplemousse. Wow, that is really fun to say! I love the fresh, bright taste of grapefruit- even if it's a little tart! Thanks for the giveaway. The pictures are awesome and I've been wanting that book! I wish I had luck! Those cards are adorable, and I too am an avid grapefruit lover. Gorgeous styling and photography, as always Helen. Have fun with your parents this week. Thanks for the giveaway! Enjoy your weekend. I listened to the pronunciation. It's a funny word. I would love to be in your drawing. What a neat giveaway. The cards are so cute! Mmmmhhh, once again your picture (or the food in it) looks so delicious! Just gorgeous! My students (ages 7-12) absolutely LOVE the word pamplemousse and will say it over and over and over again! So pretty! So fun! And Macarons?!? I love grapefruit with a little maple syrup on it. It has to be real maple syrup, yum! I am going to attempt Macarons this weekend! I am hopeful that they will be good enough to post on my Blog. The egg whites are aging as I speak. :) Wish me luck and have a fabulous weekend!! I've always loved the word pamplemousse -- for some reasons it conjures visions of a big red mythical beast with a hump and wings. I guess the color is for the grapefruit. the beast, probably because i think of moose. seems crazy but i never forgot the word when I wanted my citrus for breakfast in paris! It is always fascinating to see what you put on your site! Thank you! Hi! I love reading your blog and those cards looks yummy yummy! I'm enjoying the "French Word a Week." Also would love to win those cards and the fabulous book. First time I saw the word pamplemousse was on grapefruit Mentos. I was in college and that word made me giggle for close to 3 days! Those pictures are too cute as well! I need to paint something this weekend and something sweet sounds like a great idea! I would love those cards and the recipe book. Thank you for doing this giveaway! I just listened to pamplemousse (kind of makes me giggle too- kinda sounds like pimple mousse, ewww). I love the pretty pictures of grapefruit. That word makes me smile. wow, those cards are truely amazing, i love the contrast in colours between the chocolate and the pear in the third one. i would love to learn french....i chose spanish. That is so not as pretty! And those pictures are really awesome, i'd probably hang them on my wall!! Just have to say that I love your site and am so inspired by your photographs and the food/stories you write about - the cards are just stunning! enjoy your weekend! Love the word. Thanks for the great giveaway! I am loving your french word a week! Its a shame my macarons dont look as fantastic as the paintings! I think more practice is in order.